and bend it into the form of a circle. 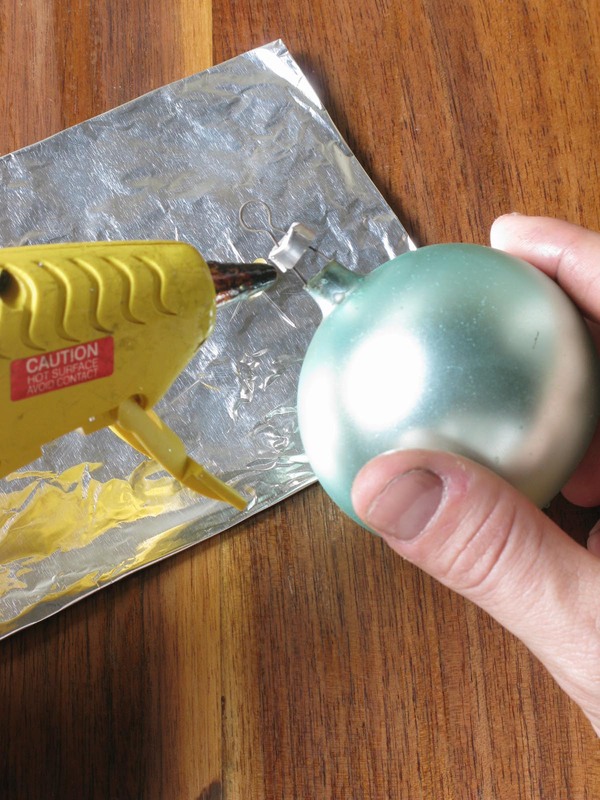 Then, grab your glue gun and as many round ornaments in varying sizes as you can find. You’ll need about 80 in all. Whenever I do my tree, I like the more unusual shapes, so it’s always the round ones I have left over. 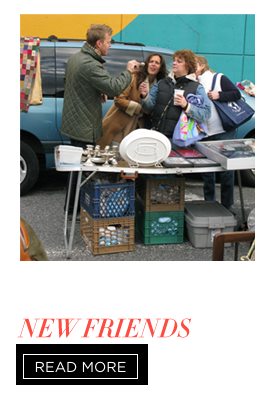 Even if you don’t, though, you can always find them for reasonable prices at a discount retailer, especially after the holidays. AWESOME!!! I can’t wait to try this idea out. Now that is one amazing wreath! What I like best is that it looks so polished and unique and at the same time is one of the easier holiday projects I’ve seen anywhere. This craft makes me want to jump in the car and drive to KMART right now to buy Martha Stewart ornaments in fun colors and sizes to mix in with the vintage one’s that I already own. What a brillant idea!! Wow! I think this is actually a craft project I can undertake with Roo while she’s on winter break from preschool… thanks! This is adorable!! This will definitely be hanging in my apartment next year. The wreath is just lovely! I was thinking he is never going to be able to get that many on it! But you did and its wonderful! Last night I had a visit from a friend that lives an hour away,she brought homemade toffee candy, a ham, ribs, potato salad, Austrian apricots, and a gift from our Chimneyville artists guild, of a wooden handmade bowl with a top, all made from a tree with worm holes, great for my Native American collection. She brought a few magazine. I cut off the computer, and sat by the fire, to read. I am thinking I know this magazine from somewhere. I look and read on. 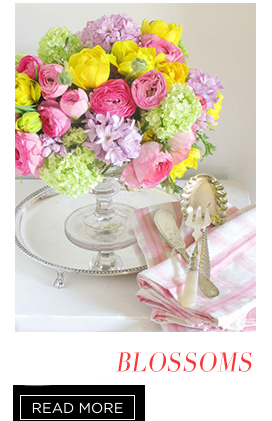 An ice bucket caught my eye, I am thinking I have one sort of like that, and a siver tray, I have one like that too. I need to fix up my bar in the cabinet I built that coming from bedroom to family room. Then I think, this chest looks familar, and the wall color. I read the heading, Oh my gosh its Eddie Ross! I am reading about his home! No wonder the chest and wall color look familar.His tree is in this place. I had a good laugh. Here I am planning my bar and all the time, I am looking at an article that was published about yours! I love the mirror in the fire place mantle.I have a similar mantle as yours too. Not sure where I am going to use it, just yet. My mantle has always been in my family room, but with the remodel going on. It may go to dining or kitchen. The parlor has a huge mirrored mantel. Thank for the tips on the bar. I have a collection in my cabinet for wine and a fridge. But trying to remake the inside to a total bar. Thanks for the inspiration, from your article in domino! Brilliant! You continue to rock my world! Eddie, I believe even I could do this beautifully elegant project! AMAZING as always Eddie! What an inspiration! This is gorgeous and so easy! I love it! I’m totally doing this next year. OMG! I love this and so easy. Thanks for sharing. I am going to go make one! this is stunning (and i recognize those amazing aqua ornaments) and as always, you make it so easy! thank you. That is a use for a wire hanger that I can embrace. Love, love, love. Oh my gosh. I’ve seen these but never knew it could be so simple! Thanks! I just bought a wreath like this all in copper and gold ornaments at Goodwill the other day to go in my kitchen which has a lot of copper pots. This would also make a wonderful surround for a vase, punchbowl, etc. on a table. I love ornamental wreaths. We have one in our hearth room and it always made me wonder how our family could make one. Thank you so much for answering that question, Eddie! Your wreath is beautiful. Perhaps my eldest will have a new holiday project for this weekend. If so, I’ll send you pictures of the finished product. Thank you as always for sharing your talents with us. Have a lovely Wednesday. So clever!!! I can’t wait to try this! This is the best holiday DIY idea ever! It looks great and way better than store bought wreaths!! Thank you for sharing. I love this idea. I have boxes of the same ornaments you collect and I don’t have enough places to put them. Thanks for the inspiration. Wow, you made that look so easy, but I’m sure mine wouldn’t be near as pretty as the one you made! Also the color scheme! So yummy looking with the colors! Great idea. Yet again, a wonderful idea and great instructions! Thank you! Beautiful and brilliant in it’s simplicity! I wish I had 80 leftover Christmas ornaments, but will start scouring ebay and thrift stores (and at least will be prepared for next year!). LOVE IT! Dwight says we can make one of those – and with your instructions I KNOW we can! Thanks for yet another inspiring, inexpensive way to brighten our holidays!!! Oh, yay! I LOVE that wreath and I am so making one!! Thanks for the idea and great instructions. Wow! I had no idea this could be done so easily! Thank you so much for sharing your project with us. I know someone who makes these and sells them for a fortune. She has often scolded people for putting them on a dooor though as the action of opening & closing smashes bulbs. She also puts an enormous layer of Elmers glue in the areas where the bulbs touch to keep the balls from moving around. Simple, genius, simply genius! It’s lovely, Eddie, and a great share. Seeing “Joan” up there makes me want to yell “now clean…up…this…mess!” LOL. Gasp..WHAT!? Is it normal that I now will have a zillion of these wreaths for year round?! Thank you dry cleaners!! Great idea Eddie! Damn it Eddie, you’ve done it again! You’ve got to be kidding me! This is so cute, and so simple! I love this idea! I once spent hours gluing ornaments to a form….your is so simple!!! Thanks for a beautiful wreath!!!! So much more darling than an ornament wreath from the store. Another winner, Eddie! I’ve seen these in magazines & it always looks hard to make, but you make it look SO easy. I thought those were all glued together. the coat hanger is brilliant & looks SO gorgeous. I just may have to put this one on my to-do list. How cool, I have always loved ornament wreaths but had no idea they were this easy to make. Thanks always Eddie! Happy Holidays!!! My freakin chin just hit the freakin floor! This was great…I can’t wait to make mine! Wow! I am totally going to make one of these this year with my mom and sister. What a great idea!! Eddie! What a great idea! I am totally going to do this. Wreaths are something that I want to add to my Christmas collection but often find them out of my budget, however, this wreath is both elegant and affordable and can be created new every year! thank you! Very clever! I made one last year, using a foam wreath and hot glue and it seems to be holding up pretty well, but this is so much easier! I also wove some green garland throughout to cover up any bare spots that you could still see. When I was a kid (many years ago), we tied plastic baggies around a hanger to make a nice wreath. The wire hangers are so versatile, aren’t they? Thank you. I have been looking for a post on how to do this and all the ones I have found have been way too complicated. So pretty! This is beautiful! I’ve been meaning to make one this year but have not gotten around to it. I think I’ll purchase some ornaments on sale this year and store them away to make this next year. WOW…Now I have to find a wire hanger. There is not a single one in my house. I have LOTS of extra Christmas balls. Thanks Eddie for this great tutorial. I have a free download for you on by blog today…check it out. I LOVE IT! and I love your blog, I am so happy that you share so much with us! I am definitely hitting the sales after christmas and making a wreath for next year! you are awesome!! love this. totally what i have been looking for, you are fantastic. how many balls did you use? I love this idea! Really lovely. Okay I’m going to do this. I hope it’s as simple as your excellent instructions show ha ha. I have enough glue gun burn scars to last me several lifetimes. what a great DIY project! love your blog more and more each post! Wow, that IS easy! I love this method. I’ll be linking. FABULOUS! I am going to do this next year! LOVES IT! This is awesome… woo-hoo… After-Christmas sales, here I come! I’ll be building this next year. Thanks. Insanely pretty. I’m doing this next year too. It’s beautiful Eddie. And so easy. I’ll have to make a note to make one next year. Time is running out for this one. 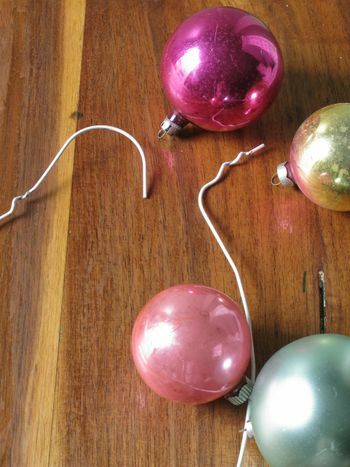 So that’s how you make ornament wreaths! Thanks so much for demystifying the process! I’m trying this next year with all the Christmas ornaments I’ll pick up on clearance after Christmas! Saw this on Craft:… I love it… gonna make it and love your toot. And love the Joan Crawford reference. genius. i’m going to make one. This is so on my to do list. I have to make one for next your. Genius! love this idea!!!! miss u eddie!!! OMG thank you so much! This is WAY simpler than what I thought it would be and also beautiful – two things I love, especially together! OMG, Eddie, I can’t believe you made that with a wire hanger. 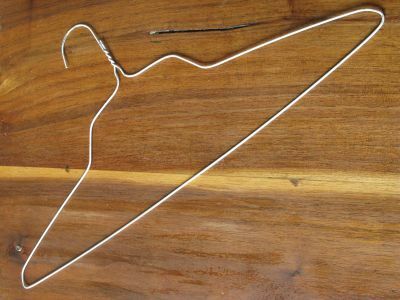 I converted to plastic hangers long ago, and I try not to buy anything that requires dry cleaning, but I’m totally raiding my closet tonight for a wire hanger. Thanks for the idea! I just love this. If I have extra ornaments, I am going to try it. The wreath is just gorgeous! Let me give you my address so you can send it to me. . haha. I love the colors and who knew it could be so easy! Have to admit though, I got a momentary shiver. . “No more wire hangers”!!!! Found you via Oh Happy Day. I haven’t even been past the first page & I know I’m going to add you to my daily reads. Oh my gosh — I made a fabulous wreath out of vintage blue glass ornaments I found at Salvation Army (a huge boot box for $3) last year. But I followed a Martha tutorial & used a form and a glue gun. Much swearing ensued. This is a fantastic idea! Next Christmas, I’m coming back here. Thank you! I too collect vintage glass ornaments. I will be on the look out for a bunch of rounds to make this lovely wreath. Goreous, Oh Eddie I love you. I’m going to so do this next year. Thanks for the inspiration. Oh my gosh this is SO much easier than the one I made! I will definitely do this next year! What I want to know is how to make that BOW! Thanks for this! Looks stunning but seems surprisingly easy to make. I will make this next year when I find lots of cheap baubles in the sales. 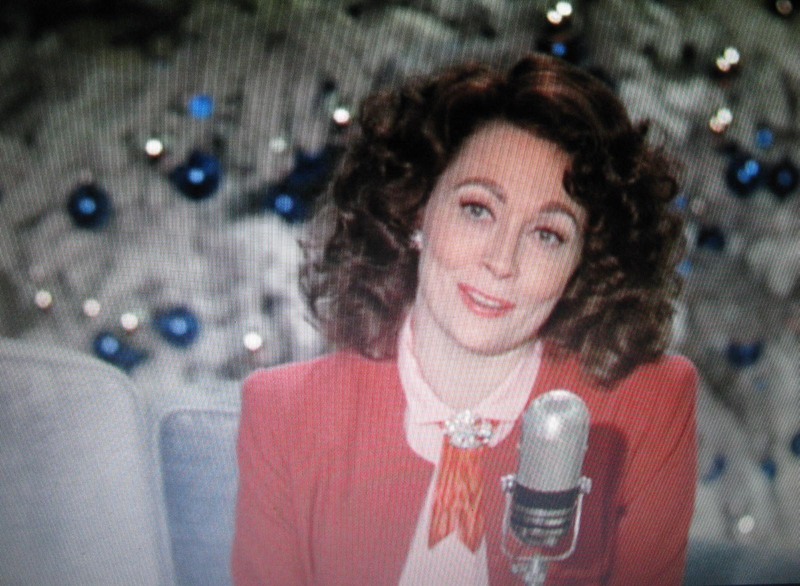 Only our Eddie could combine hot glue, ornaments and Mommie Dearest. This is truly stunning. I think I love you more than Joan Crawford! Love love love the wreath! Could you do a post on how to create the perfect bow?? I just made an indoor wreath and I love it all except for the bow I made to hang it up with! I know your tips and tricks on how to create the perfect bow would be fantastic! I love that! I’m going to have to pick up some ornaments at the day after Christmas sales. I could even have my students make these – if I can get the ornaments cheap enough. Holy moly, if Christmas weren’t almost over. Sniff. 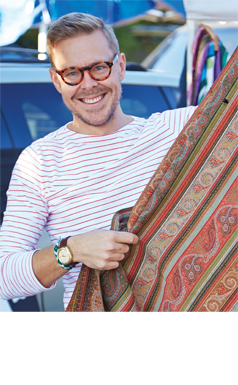 PS Eddie, you know I would totally love to sell you a Moroccan carpet or blanket at a super good price. Just let me know what catches your fancy. I have wanted to know how to make one of these for years! I love your simple tutorial! Thanks so much. Super duper cute and easy… Thanks. Hi Eddie, I was so inspired by this beautiful wreath that I made a similar small version for a vintage piece that I am showing on my blog. Hope you check it out. And, while you’re there take a look at our very special Christmas tree, designed completely by my 5 year old grandson. Were you designing at that age? He has great ideas all the time. http://www.rescripted.blogspot.com Best holiday wishes!!! I saw your wreath on “One Pretty Thing.” It is absolutely gorgeous. Oh MY this is SO much easier than it looks! I’m going to have to stop throwing away the wire hangers and try this! Great idea! Perfect! I needed a reason to keep collecting!!! Thank you! great idea!! i am trying one right now!! but i need some help!! did you find that a certain pattern (1 big, 1 small, 2 big, 4 small, etc) worked best?? I can’t seem to get the ornaments to set right?? That is beautiful!! This looks easy enough for a klutz like me to try…LOL. Now all I need is the instructions on how to make a glass ball ornament table top tree. 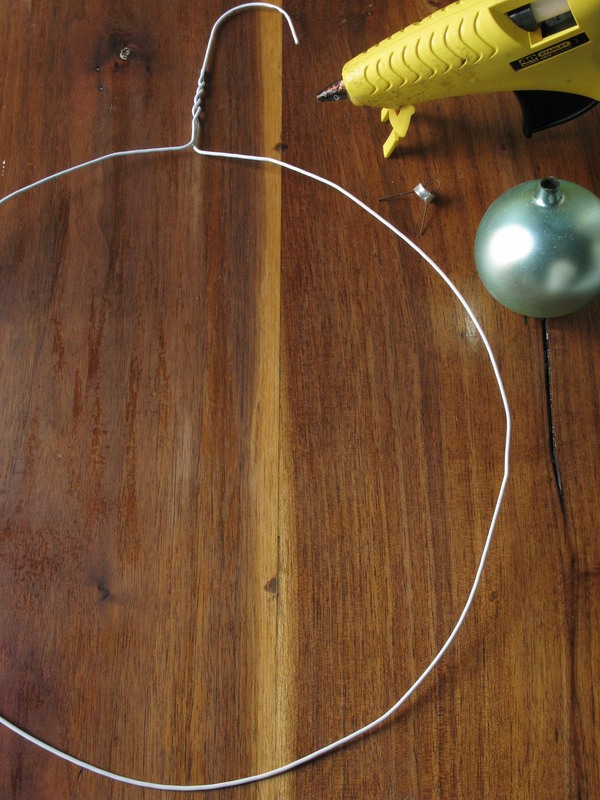 Not sure how to form wire to make the shape of a small tree—how to attach the balls, etc. How beautifully simple! Thanks so much. I’ve got to make these!! great simplt wreath,but where to get ornaments? Something I never expected to make of like that. Love this idea..cute and lovely. Whoah! That came out really great, I just put away all my Xmas stuff, but next year, this puppy is goin’ up. Aha! I’ve got my vintage Shiny Brites ready to go (donations to the Caring Place, this wreath will be for silent auction to raise funds for the facility) — I was vexed on just HOW to make a sturdy wreath without overdoing the glue…and voila’, here YOU are and it’s fabulous. THIS WILL MAKE A GOOD CHRISTMAS GIFT !! Thank you for the idea. This will make a great Christmas gift. Thank you for the idea !! That is actually surprisingly pretty for such a simple idea. 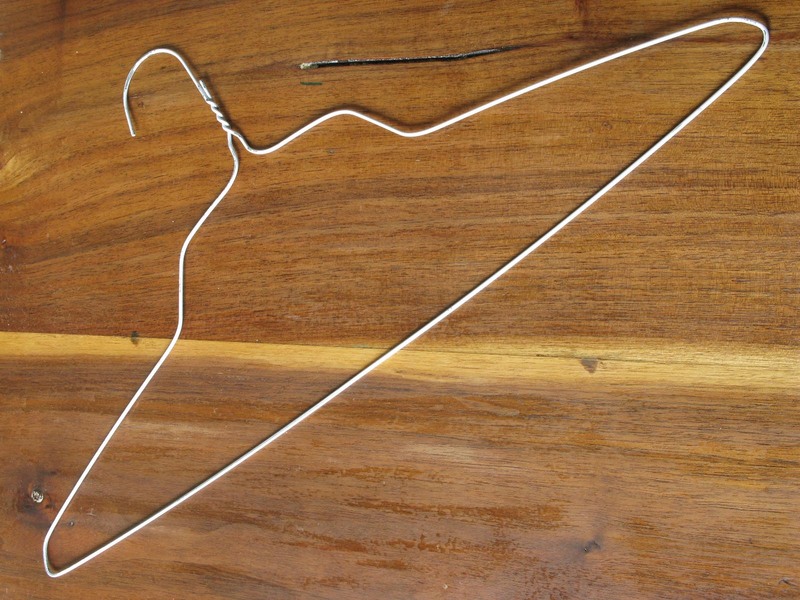 Pity wire coat hangers are so difficult to get hold of these days. Like it, we tent to use natural foliage on yours but your one would last longer. Oh my, I am finally making these this year for gifts and can not for the life of me make that beautiful sash and bow on the wreath. Are they two different pieces? If anyone can help me with this, please email me. That is such a great idea to use a wire hanger. Who doesn’t, besides Joan, have wire hangers around the house? I have some vintage bulbs that I don’t use on my tree, but they would make a great small wreath to hang on an armoire door, etc. I think it would be easy to cut those hangers to whatever size you need and then just twist the top back. Thanks for the great tip! ABSOLUTLY FAB-U-LOUS DARLING! love it, beautiful colors too. THANKS SO MUCH FOR THE TUTORIAL! Love it! What a simple yet elegant project for the Holidays. Thanks for sharing, Eddie! So fabulous and easy-peasy. This is definitely a project I’m taking up very soon! Love it! It’s gorgeous! Thanks for the clever idea! Wow, I made one of these years ago, but your method is tons easier than mine. It’s beautiful! Beautiful! I love the door too! I just posted my gorgeous ornament wreath! Thanks for the fantastic idea! 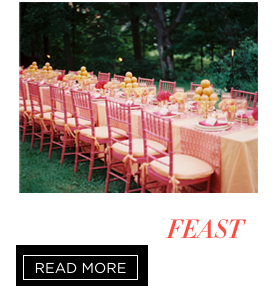 dear eddie, i followed a link here from thrifty decor chick blog and i am sure you dont have time to respond to this but i thought id ask my question anyways. ya never know right? ok so i have a storm door in front of my real front door. i am swooning over this project but it looks like the ornaments go all the way around the hanger making it twice as thick as a normal wreath and there fore not fitting in between real door and storm door. do you have any suggestions on how i might do this project but keep it flat on the back so that i can cram it in that space? hahah. thanks for reading this and sharing our cool project. Amazing and lovely. Thank you I’ll def have to make one! 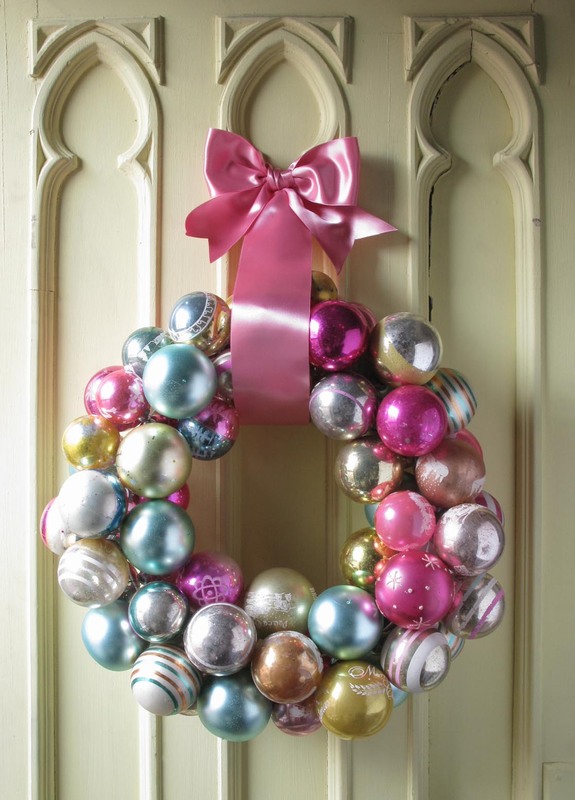 I just saw the link to yours at the Thrify Decor Chick – love the wreath, I’m going to give this a try! I couldn’t be MORE in love with this idea!!! I’ve been collecting vintage Shiny Brites for a few years now – filling up my empty vases and cloches. Now – to have them on a wreath? And how SIMPLE it is, too!! Eddie, you’re the right brain I’ve always wanted…..and the right brain mine desperately yearns to be!! Eddie: First off – I gotta say, Jaithen is a RADASS name. I have 3 boys – why did I never hear of that before I named them? Thanks for sharing your wreath wisdom. If I’d known how to do this, I’d have never told the secret wonderfulness. 😛 Lucky for the world, it was you who was oh-so clever. Thanks! Am so going bargain glass ball shopping post-Christmas! Not bad for what groups. I love it. I too copied this fabulous wreath Eddie. You are genious! Thanks for the tutorial! Made this wreath in blue and silver. This is the perfect project budget wise! So simple and updated. It’s not just pretty, it’s beautiful! Love the wreath. I linked it in my own blog. I’ve been looking for this post forever! I’m so glad I found it! I saw this (I THINK?) on Martha Stewart awhile back and have been thinking about it ever since. I’ll be featuring you and this post on our blog tomorrow, hope you don’t mind. 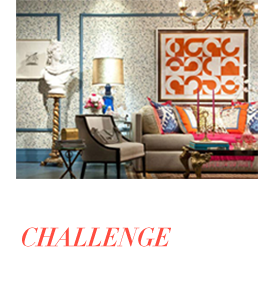 Check it out at InCircleInteriors.blogspot.com. Okay, I’m going back to Goodwill tomorrow to get the ornaments I saw and making this tomorrow! So cute and it looks easy! Easy enough to find time to finish before my dinner party Friday evening. I loved the idea so much that I made one and posted about it with a link to your post on my blog. Eddie, this is genius. Your joyous style is beautiful and elegant. Your ability to inspire and empower is AMAZING. Thank you. I love this idea! I’ve been wanting to make a wreath out of ornaments for a bit now and I think this wire hanger idea is the perfect way to do it! Thanks for sharing and Happy Holidays! Well, actually it’s incredibly gorgeous!!! And sounds simple! I don’t have 80 ornaments, but I do have some vintage ornaments I bought via Craigslist, and (I’m so dumb 🙂 when I got them home I realized they’re in very poor condition – no shine, all scratchy like … what shall I do? Any ideas? Use as is? Fake a shine on them? Thanks! I am so happy that I was patient enough to track down beautiful old vintage balls in all the right colors. Thank you so much for all of your inspiration. Merry Chrsitmas! Love, love, love. I have a box full of vintage ornaments and this is the prettiest, simplest way to arrange them. THANK YOU! OMG!!!! I LOVE THIS! I have been tiknihng about a project with the googly eyes and this is perfect!!!!! definitely pinned this one! I love this idea. Simple, easy, and cheap. That’s my kind of project. Wow, really good creativity on making xmas things. I will try to do it for sure for next xmas :D. Loved the blog. I can’t wait to see how it turns out! What a great idea to slip them on a hanger! All of the ones I’ve seen are glued to a stooafyrm form, but this seems like it’s so much each and anything that doesn’t involve burned fingers with hot glue I’m all for!